A 2017 study that was published by Stanford University suggested that fossil-fuelled cars would vanish within eight years – and citizens will have no choice but to invest in electric vehicles or similar technologies. This, according to the report, would bebecause the cost of electric vehicles – including cars, buses, and trucks – will ultimately decrease, resulting in the collapse of the petroleum industry. Led by Stanford University economist, Tony Seba, the report had caused spasms of anxiety within the oil industry, when it was released. Entitled “Rethinking Transportation 2020-2030,” it had detailed how people will ultimately switch to self-driving electric vehicles, stating that they would be ten times cheaper to maintain than cars that run on fuels. According to the report, in less than a decade, it would become very difficult for consumers to find petrol stations, spares or mechanics knowledgeable enough to fix combustion engines. His ultimate premise was that modern-day car dealerships would disappear by 2024 as the long-term price of oil. Clearly, while the advent of electric cars may not be embraced in Africa in the coming years as estimated by Seba, this innovation coupled with shale oil as well as other technologies in crude oil production is going to disrupt the sector. Indeed, it is going to have an attendant effect on the demand for crude oil from Nigeria and other oil producing economies. In Nigeria, oil accounts for almost 90 per cent of the country’s export and 95 per cent of revenues, respectively. In fact, when the economy slipped into recession in 2016, it was because of the collapse in crude oil revenue and an increase in oil production saw the country exiting recession. But the oil industry contributes little in direct employment relative to its contribution to government revenues. The foregoing therefore was the reason why experts that spoke at the Nigeria Economic Outlook Conference (NEOC) 2018, stressed the need for government to genuinely pursue its much talked about drive for economic diversification. No doubt, the country’s abysmal low tax base, as well as the internally generated revenue are all because of laziness on the part of the country’s political leaders since the discovery of oil. In addition, the political tension and civil arrest in the country have in most cases by traced to the fight for share of the revenue accruing from oil revenue. Also, there have been outstanding and rapid developments in the field of robotics, leading to the emergence of robots that can replace human in many manufacturing process. As a result, the manufacturing activities that were typically outsourced to developing countries in the past due to high labour cost. To the President of Times Economics, an economic consulting firm and the organiser of the NEOC, Dr. Ogho Okiti, there need for policymakers in the country to start preparing for a Nigeria that is not driven by activities in the global crude oil market. He noted that for five decades, Nigeria’s relationship with the global economy was shaped by the sale crude oil and the attraction of investment to the sector. Okiti, however, pointed out that in the last decade, two important features have continued to threaten the allure to the country’s oil sector. “First, we have seen and continue to see, very aggressive development of alternative sources of energy. “Secondly, we have also seen the development of technology that made previously inaccessible crude oil available at reasonable cost. “Combined, the implication is that today, the world thinks more about when there would be a peak in the oil demand, compared to about 20 years ago, when the thought was about whether the world would run out of oil,” Okiti explained. These, he also noted would have severe implications for the Nigerian economy and its future relationship with the global economy. “If development continues at this pace, the manufacturing route to prosperity which was once open to Asian tigers, could be closed to Nigeria. “The shift towards nationalisation as seen in United States and the Brexit referendum has also influenced hostility towards international trade and migration,” he warned. To the founder and chief executive of the Computer Warehouse Group (CWG), Mr. Austin Okere, there is need for increased investment in human capital to drive activities in the country, especially the non-oil sector of the economy. Okere noted that the issue about crude oil is that it dominates so many other sectors and makes it difficult for policymakers to take their eyes away from it. “Crude oil prices would go up and down and nothing is going to hold it stable. There are other areas such as media, entertainment, agriculture, that we can develop and even export. “I think we should start looking at the fourth industrial revolution and how we can leapfrog on it. But I think we shouldn’t be too fixated on crude oil prices,” he added. Also, the chief executive, Rise Network, Mrs. Toyosi Akerele-Ogunsiji, urged Nigerians to disregard the notion that the country is an oil-rich economy, saying that countries are not adjudged to be rich because of what they have, but because of their know-how. She expressed disappointment that since the discovery oil in the country several decades ago, it has remained only at the stage of primaey production with no value addition. “At the end of the day, oil will not refine itself, you need the human capital of those countries to be able to refine the oil. “If you really appraise the parameters you measure to know whether countries are successful or not, Nigeria does not feature in any of it. But the challenge is the amount of energy we spend discussing issues around oil. There is need for the country to prepare for a post-oil economy. “We need to start thinking about how to move on from a country that is so oil dependent to a country where we can begin to create wealth. The truth is that economies that consume are superior to economies that produce,” she argued. On his part, the chief economist at Macroafricaintel Investment LLC, Dr. Rafiq Raji, noted that less demand for crude oil as a result of electric car and other innovations in crude oil production means that any supply management by the organisation of petroleum exporting countries (OPEC) in the future may not succeed. “Our vulnerability extends to the fact that we are not preparing for that future. The best we have been able to do is to talk about how agriculture can help us. “Now, if developed economies can produce goods with less human needs and in a cheaper manner, that means there is nothing we can do to be competitive,” he explained. The Minister of Finance, Kemi Adeosun, recently pointed out that the federal government was no longer bothered by fluctuations in the price of crude oil. According to Adeosun, the federal government has learnt to live with a low crude oil price. “We have gotten to a point where we don’t care whether oil prices will be sustained at the level that they have recently risen to. “We have been able to balance our budget at $45-$46 per barrel and we’ve got to learn to live comfortably at that level,’’ she said. For Raji, there is need to increasingly encourage activities in the non-oil sector, especially as regards to innovation, as well as make sure there is adequate policy around credit. “When you don’t resolve some of the structural challenges, like power for instance, there is not much that can be done. Unless we resolve some of these constraints, we are not going to extract wealth from the real sector,” he advised. Also, Okere pointed out that the biggest employers of labour in the country presently are the entrepreneurs, stressing the need for capacity building and other incentives that would encourage business owners. “Many of them can do better if they are empowered with technology and inclusiveness. The human capital development is extremely important, because that is where the wealth is. “Power is the fundamental for industrialisation. Another thing that very important is broadband,” he added. The foregoing shows that there is an urgent need for the country to fast-track its transition to a post oil economy. Government at all levels need to start thinking and encouraging creativity and innovation. All over the world, there are resource rich countries that are not dependent on commodities and have been able to transform their economies. What the country requires today is to enhance its investment in infrastructure, education and manpower development, which would in turn drive competitiveness. The Public Relations Consultants Association of Nigeria (PRCAN) has commended President Muhammadu Buhari for signing the Executive Order criminalising the excessive use of expatriates to render professional services in the country. The body’s commendation is coming on the heels of increasing use of expatriates for jobs and services that could be provided by Nigerian professionals. PRCAN said the move was a valid extension of the Federal Government’s Buy Nigeria, Save the Naira campaign, insisting that most government officials have treated the campaign with contempt. It assured President Buhari of its readiness to play the role of whistle blowers in relation to the Public Relations and Marketing Communications sector and promised to provide the Presidency with the details of foreigners operating agencies illegally in defiance to the laws regulating the industry. “President Muhammadu Buhari can rest assured of our support in this regard. We will compile the names and addresses of those currently operating illegally here against the extant law regulating the Public Relations practice in Nigeria. Egypt will begin approaching investment banks in a few days for a planned sale of euro-denominated bonds after successfully raising $4 billion from international debt markets to finance the budget deficit and bolster foreign reserves, Finance Minister Amr El-Garhy said. The sale of 1 billion to 1.5 billion euros in notes will “ideally” take place in April, and Egypt wants European banks to manage it, the minister said in a phone interview. On Tuesday, the government received about $12 billion in offers for its dollar-denominated bonds, in what the minister described as a “vote of confidence” in the Egyptian economy. The strategy of becoming a regular issuer on international markets will enable Egypt “to borrow easily and at relatively better pricing,” said Mohamed Abu Basha, an economist at investment bank EFG-Hermes in Cairo. While the global market turmoil last week also hit the assets of developing nations, investors are still tempted by higher-yielding emerging debt in a world that remains awash with central bank stimulus. For the Egyptian government, however, borrowing costs on international markets remain much lower than local-currency debt. Tuesday’s issuance completely covers Egypt’s financing gap for the fiscal year ending June 30, Deputy Finance Minister Ahmed Kouchouk said. It brings to $11 billion the total amount of international bonds Egypt has sold since floating the currency and securing a $12 billion International Monetary Fund loan in November 2016. The terms for the latest issuance were less favorable than last year’s due to the increase in global interest rates, El-Garhy said. 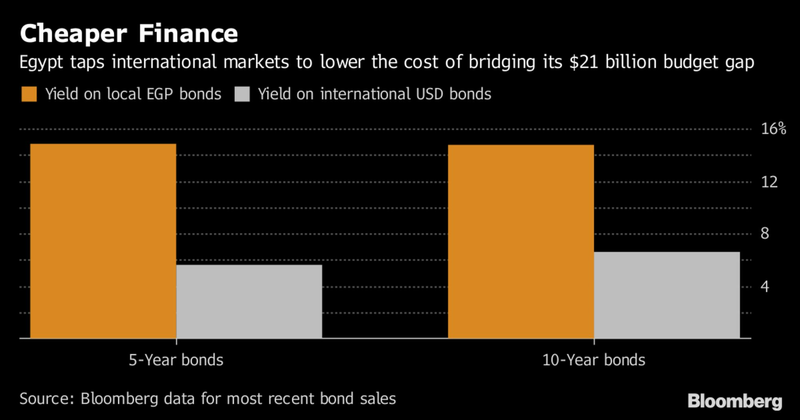 “We could’ve secured cheaper pricing since our risk position has improved since the last time we tapped the market, but the rise in yields on U.S. Treasuries has affected us,” El-Garhy said. Egypt’s foreign-currency reserves have been steadily increasing since 2016, climbing to a record $38.2 billion January. Tuesday’s issuance was broken down into three parts: $1.25 billion in five-year notes with a yield of 5.58 percent, $1.25 billion in 10-year notes with a 6.59 percent yield; and $1.5 billion in 30-year notes with a yield of 7.9 percent, the Finance Ministry said in an emailed statement. The euro-area economy maintained its robust growth pace at the end of last year, setting the stage for another solid performance in 2018 that may sway European Central Bank policy makers into winding down unprecedented stimulus. Gross domestic product increased 0.6 percent from the previous three months, Eurostat reported Wednesday, confirming a Jan. 30 estimate. Growth slowed in Germany and Italy, while the pace of expansion accelerated in the Netherlands and Portugal, according to separate reports. The European Commission has said the economic expansion in the 19-nation region is now more balanced than at any time since the financial crisis, and the International Monetary Fund has raised its global outlook for 2018. ECB policy makers say they’re increasingly confident that robust growth will slowly rekindle price pressures, paving the way for a gradual withdrawal of monetary accommodation. Germany’s upswing -- despite a slowdown in quarterly output -- continues to be a key ingredient for growth in the euro area. Momentum in the country at the end of last year was driven by a strong increase in exports, according to a national report. Government consumption and equipment investment increased, while private spending remained largely unchanged and construction slipped. The Dutch economy also benefited from buoyant global trade. GDP increased 0.8 percent in the fourth quarter, exceeding economist estimates. Italian growth slowed to 0.3 percent, leaving it lagging behind France and Germany and providing a note of caution ahead of general elections next month. GDP increased 0.7 percent in Portugal. Elsewhere, the Japanese economy continues to look healthy after two years of uninterrupted growth, even though growth slowed to 0.1 percent in the fourth quarter amid weaker public demand. Singapore lost some of its momentum at the end of 2017, with the government projecting a slight moderation in growth this year as an export boom eases. 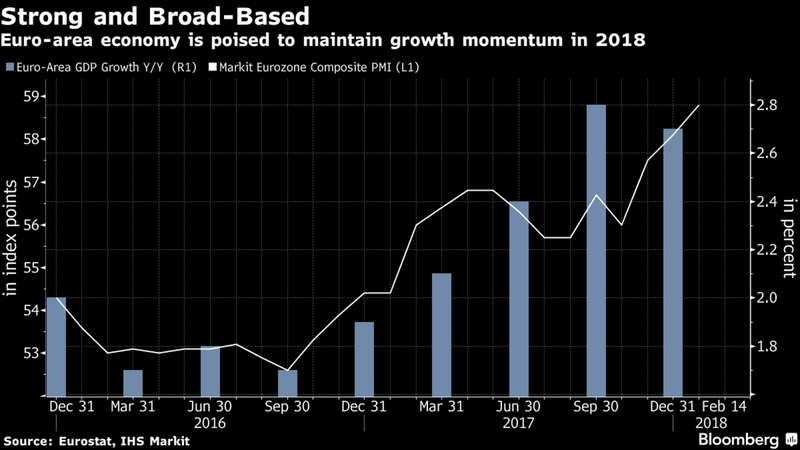 Economic momentum in the euro area surged to the fastest pace in almost 12 years last month, a business survey showed, pushing firms to pile on the most additional workers since the start of the millennium. While ECB President Mario Draghi has welcomed the region’s strengthening momentum, he also cautioned against removing stimulus too quickly in light of still-muted inflation. Consumer-price growth slowed to the weakest since July at the start of the year. Delta Air plane in the early hours of Wednesday, made emergency landing at the Muritala Muhammed International Airport , Lagos shortly after taking off when the pilot of the plane noticed that the left engine of the aircraft caught fire mid air in-flight. Although there is no death recorded as at the time of filing this report but quite a number of crew and passenger casualties were recorded and have been taken to Lagos State University Teaching Hospital, LASUTH, Ikeja, Air Force Base Clinic and Federal Airports Authority of Nigeria, FAAN, Medical Centre for speedy medical attention. Meanwhile, the incident led to the closure of the runway as the Delta Aircraft was on the Runway for over 1hour thereby preventing KLM, Lufthansa and Air France already positioned for take off from departing. The aircraft was later towed with a push back truck to the open parking bay close to Boarding gate E 63. The remaining casualty - free passengers have been taken to an Hotel after the flight was announced cancelled and rescheduled for a date yet to be specified and communicated. The Nigerian Civil Aviation Authority (NCAA) on Wednesday said it would investigate the emergency landing by an Atlanta-bound Delta Air Lines flight at the Murtala Muhammed International Airport, Lagos. The General Manager, Public Relations, NCAA, Mr Sam Adurogboye, disclosed this to the News Agency of Nigeria (NAN) in Lagos. Adurogboye said that NCAA had been notified of the incident, stressing that it was the duty of regulatory authority to investigate such occurrences in order to ascertain what led to it. He noted that the pilot acted in accordance with the Standard and Recommended Practices (SARPs) by making an air return immediately the left engine of the aircraft caught fire in-flight. NAN recalls that the Delta Air Lines flight 55 which took off around 10:50 pm on Tuesday, made an air return less than an hour later due to an engine fault. The pilot announced the evacuation of all the passengers on board within 90 seconds, after contacting the control towers when the left engine of the aircraft caught fire. A statement signed by the United States carrier’s media consultant in Nigeria, Mr Tope Awe, on Wednesday, said the A330-200 had an issue with one of its two engines. “The flight landed safely and customers exited the aircraft on the runway via emergency slides. “Airport fire authorities met the aircraft upon arrival. Delta’s customers were bussed back to the terminal. “Delta teams have provided overnight hotel accommodations to customers and will rebook customers on an alternate Delta aircraft Wednesday afternoon. “The safety of Delta’s customers and crew members is always our top priority,” Awe said. There are indications that the United States may halt crude oil import from Nigeria by 2022, as it moves closer to becoming a net export of petroleum products.The United State Energy Information Administration (EIA) has projected that the United States will become a net energy exporter in 2022 in the newly released Annual Energy Outlook 2018, primarily driven by changes in petroleum and natural gas markets. Nigeria saw a significant reduction in the US imports of its crude in recent years, starting from 2012, following the shale oil production boom.The U.S. imported a total of 28.53 million barrels of crude oil from Nigeria in the third quarter of last year, up from 18.88 million barrels in the same period in 2016; 10.13 million barrels in 2015; 5.10 million barrels in 2014; and 21.23 million barrels in 2013. According to EIA, the transition from net energy importer to net energy exporter occured even earlier in some sensitivity cases that modify assumptions about oil prices or resource extraction. Sensitivity cases with less energy production project that the United States will remain a net energy importer through 2050. It stated: “The transition of the United States to a net energy exporter is fastest in the High Oil Price case, where higher crude oil prices lead to more oil and natural gas production and transition the United States into a net exporter by 2020. In that case, higher crude oil prices also result in higher petroleum product prices and lower consumption of petroleum products, driving decreases in net petroleum imports. “In the High Oil and Gas Resource and Technology case, with more favorable assumptions for geology and technological developments, the United States becomes a net exporter in 2020, and net exports increase through the end of the projection period. In cases with relatively low oil prices or less favorable assumptions for geology and technological developments, U.S. net energy trade still decreases, but the United States remains a net energy importer through 2050. EIA said that U.S. net petroleum trade—crude oil, petroleum products, and natural gas plant liquids—has fallen in recent years, reaching 3.8 million barrels per day (b/d) in 2017 based on data through November. He expressed concern that the country has not been able to capture the African terrain of the market, adding that the market must be captured in terms of contract awards, whether in crude, investment or other formulations. An ad hoc committee of the House of Representatives on Tuesday summoned the Governor of the Central Bank of Nigeria, Mr. Godwin Emefiele, over the N17bn non-performing loans recorded by the National Economic Reconstruction Fund. Also to appear before the committee, which is chaired by a member from Ekiti State, Mr. Ayodele Oladimeji, are the Managing Director of the Nigeria Deposit Insurance Corporation, Mr. Umaru Ibrahim; and the Managing Director of the Bank of Industry, Mr. Olukayode Pitan. The committee is investigating reports that NERFUND went under as a result of the loans, following which the Federal Government hurriedly merged it with the BoI. Lawmakers are asking questions on why the loans are not recovered, in addition to investigating the beneficiaries. Among the allegations were that “acolytes of the management” and some members of staff were among the beneficiaries. The committee also has information that some members took a N500m facility with a repayment period of up to 20 years at only one per cent interest rate. At Tuesday’s session, Oladimeji recalled that NERFUND was shut in disregard to a standing resolution of the House, which directed that further actions on the agency should be put on hold pending the outcome of the probe. He added that Emefiele was summoned to tell Nigerians why the CBN failed to ensure that the loans were recovered. He also stated that the committee was interested in knowing the legal basis for the merger with the BoI. The committee observed that the members had yet to be convinced on how NERFUND, which had an initial capital of N300m, could go under, while some commercial banks were posting profits in billions of naira. The committee cited the case of Zenith Bank Plc and several others that started business around 1989 just as NERFUND did. Oladimeji added that if NERFUND could fall easily, there were no guarantees that the BoI, the newly-inaugurated Development Bank of Nigeria or the Bank of Agriculture would survive for long. He stated, “With all the precautions taken by the NERFUND Act, NERFUND was not supposed to be distressed. What has the CBN done to recover the loans as prescribed by the Act? However, the Ministry of Finance claimed that NERFUND was not merged with the BoI. A representative of the ministry, Olubunmi Siyanbola, told the committee that a process to wound down the agency began in 2013 and was followed through. She stated that the BoI’s role was merely to recover the non-performing loans after all the members of staff of NERFUND resigned. She explained, “NERFUND had 82 workers, but the entire 33 senior management staff resigned in August 2016 on the verge of the presentation of the report of the presidential committee that investigated the Fund. The Nigerian Ports Authority (NPA) on Tuesday disclosed that only eight Federal Government agencies are allowed to operate and have physical representation at all port locations in the country. The General Manager, Corporate and Strategic Communications of NPA, Alhaji Abdullahi Goje, said in a statement in Lagos that the disclosure was based on the directive of the Presidential Enabling Business Environment Council (PEBEC). Goje said that PEBEC had directed the NPA to ensure strict compliance to the Oct. 26, 2011 presidential directive on agencies permitted to operate in the ports. “Agencies allowed representation at the ports are: Nigerian Ports Authority (NPA), Nigerian Customs Service (NCS), Nigerian Maritime Administration and Safety Agency (NIMASA), Nigeria Police, Department of State Security (DSS). “Other agencies are: Nigerian Immigration Service (NIS), Port Health and the Nigerian Drug Law Enforcement Agency (NDLEA),’’ he said. He stressed that the other agencies not mentioned on the list must remain outside the port premises. The NPA spokesman said that the authority remained committed to the Ease of Doing Business policy of the administration of President Muhammadu Buhari. He said the presidential initiative was to improve the conditions under which business was carried out at all ports across the country. Goje solicited for the support of all agencies and stakeholders in the Nigerian Maritime Sector towards making Nigeria, a destination of choice for all legitimate businesses. LONDON/YENAGOA, Nigeria, Feb 14 (Reuters) - The Court of Appeal in London ruled on Wednesday that two Nigerian communities cannot pursue Royal Dutch Shell in English courts over oil spills in Nigeria’s Delta region. The split decision upheld a High Court ruling last year that was a setback to attempts to hold British multinationals liable at home for their subsidiaries’ actions abroad. The court rejected the appeal from law firm Leigh Day on behalf of Nigeria’s Bille and Ogale communities, and upheld a ruling that English courts do not have jurisdiction over claims against Shell’s Nigerian subsidiary Shell Petroleum Development Company (SPDC). Shell said the court “rightly upheld” the earlier ruling, and said Nigeria’s “well-developed justice system” was the correct place for the claims. Its subsidiary SPDC has also denied responsibility for the spills, which it says were due to sabotage and illegal refining. One of the three senior High Court judges, the Rt. Hon. Lord Justice Sales, disagreed with the majority ruling, writing that the communities have “a good arguable claim that (Shell) assumed a material degree of responsibility in relation to the management of the pipeline and facilities” operated by SPDC. King Okpabi, the ruler of the Ogale community, said the English courts were the only hope, and that they “cannot get justice” in Nigeria. The case is significant in determining whether multinational companies can face legal action in England over their subsidiaries’ actions abroad.